Landing between the world class March Signature auction and the exciting multi-consignor May sale, we present the Spring BASICS sale. This single day auction will offer several hundred lots to include American & European trains ranging from 0 gauge to standard, pressed steel trucks & Kingsbury cars, German and French tin autos & motorcycles, Lehmann toys & Fernand Martins. Cast iron will be highlighted by still banks exclusively from the Douglas Jackman collection, mechanical banks, and a handful of iron autos. American comic character tinplate will be matched by Schuco, Japanese and European tin toys, and a dozen lots of paper on wood toys. Check back often for more information and auction updates. A PDF catalog is available as well as multiple digital catalogs. What better way to lead off Memorial Day Weekend than bidding on some choice antiques with Bertoia’s? Our Thursday & Friday auction will be highlighted by the Ned Bauer Still Bank collection coupled with fabulous mechanical banks & doorstops. Marklin trains will be accompanied by early American standard gauge and 2″ selections. Comic character and pre-war Japanese toys will be presented, many with nicely lithographed boxes. Early European tin toys and autos will be sure to capture a worldwide audience with the last of the Fernand Martin items from the Frank Mohr collection. Halloween collectors will be sure to be satisfied with over 100 lots ranging from figures and cats to die-cuts. Cast iron toys will be highlighted by Vindex farm, Arcade autos, and aeronautical. Pressed steel from the Tiny Moyer collection will continue to impress collectors with a nice selection of pedal cars to be included. A full color catalog will be available as well as several digital catalogs. All consignment discussions are kept confidential. Whether selling a single piece, downsizing your entire collection, or simply preparing a long term estate plan, we look forward to speaking with you. 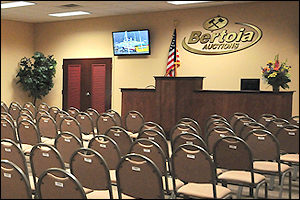 Please contact us to discuss the selling options, future auction schedule, and to learn more about the easy process of selling with Bertoia Auctions.